Fl.30154. 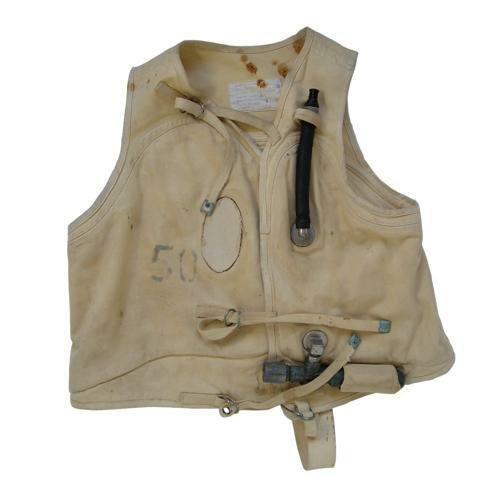 A waistcoat style life preserver developed by Drager in the late 1930s. This example made at the Dragerwerk factory in Lubeck on 6th July 1939. Manufactured in yellow rubberized canvas with a single continuous inflatable chamber. Three simple canvas straps with ring buckles fasten at the front and a single strap passed between the legs. A carbon dioxide cylinder was provided for inflation, situated on the lower left lobe and operated via a screw valve. A rubber oral inflation tube was provided so the wearer could 'top-up' the pressure if necessary. This early pattern, designated as a Model SWp734 on the label, has a 'full back' whereas later versions were produced with an 'open' or cutaway back to improve stability in the water. It also has the early metal screw valve on the CO2 cylinder although fitted with a later plastic mouthpiece - perhaps as a result of damage to the original metal one. The canvas is generally in good condition and has probably been cleaned, resulting in a somewhat washed out appearance. It does have a few small holes, some rust type staining and what appears to be a period repair patch. Unfortunately the inner rubberisation has completely perished and what remains can be felt in lumps around the base of the waistcoat. The straps and cadmium plated rings are good bar some vergigris deposits. Complete with good 'Auer' manufactured brass CO2 cylinder (Fl.30153) dated 7.40 (later inspection date of 7.43 as well). The connector, screw valve knob and oral inflation tube are also good. The Schwimmweste is labelled but this is rather worn and faded. Fortunately the early designation number, manufacturer details, serial number and date are still legible. The number '50' has been marked to the front of the waistcoat this appears to be period and theoretically could refer to JG50. As well as being standard issue for Luftwaffe aircrew during the Battle Of Britain these also had great kudos with R.A.F. pilots and some were 'captured' as war booty and worn in preference to the issue R.A.F. 1932 pattern. Notable are 617 'Dam Buster' Squadron commanding officer Guy Gibson and Battle of Britain ace Eric Stanley Lock, both who used the Luftwaffe 10-30. Later versions of the SWp734 were designated as the 10-30, later still becoming the 'open backed' 10-30 B-1 & B-2. Reasonable overall condition and an excellent display piece. Stock code MW22807.